Another secret 968 under the cover by any chance........? If anyone is interested the other black 968 Turbo RS has appeared on carsales today. Asking price is $130K. This is #2 of the 4 original cars Fitzgeralds built in the 1990's, but not to be confused with #4 discussed previously in this thread (my car). This was considered the best of the 4 cars because of it's originality and relatively low miles. Current owner has swapped out the CS seats but has the originals. Be quick if you're interested as mine attracted considerable interest from overseas when it was last up for sale. I've seen this car, 968 rs, in the wild - twice. ? Genuinely interested in this car but is it really with the asking ? I know a CS has gone through the roof but someone tell me something to convince me of the cars value. Take it for a drive? Ad says no offers or test drives? Makes it hard to deal with the seller by the sounds love the car just not sure if it’s value. Already own a 996.2 gt3 and 930 and thought this would be another great addition without having more of the same. You would like to think if you turned up in either car you’d qualify for a test drive? Price does seem steep, I’m sure it’s a great drive though. I was offered close to that for mine from a person in NZ a couple of months back who was following my restoration. I'm not selling by the way, it was just a discussion. They really are an awesome car, best combination of handling and power from any of the transaxle models, and many 911's until recently. Only criticism is the ride which is very hard on the road. I know a relative of the former owner of the WA (now NSW) car - I know that thing was a weapon but as Simon said its lived a hard life. Maybe into the wall at some stage if I remember correctly. Maybe stacked and fixed a few times? I've always loved the CS - You could buy John Bowes white one for 50k but could you achieve the same as the black one for the extra 25k? Possibly but couldn't be bothered with trial and error, tuning, testing and development. And there is something cool about mimicking the factory setup rather than aftermarket, even if things have moved on. There's a unique cars article by john bowe test driving the falken car. I assume it's this car ^^ back again. Rob had it at $113k in 2014 and fell all the way to $75k before selling (maybe to the current owner?). I liked it but.......baulked. as for the ad and "there will be no more", I know Peter was building a red one for a customer a couple of years back when I was visiting his workshop regularly. But he did say it was eye wateringly expensive to build (AFTER you spend $85k on a CS!). But when a GT3 is 130-150k, it's hard to see a 130k 968 as good value. Needs a half cage and original Recaros and ditch that beige leather 4 seat interior, doesn't "fit" at all. I believe it’s got the cage and seats with it, but I drew the same line in regards to 996 gt3 values atm. If they are sitting on the market @ 150k then I can’t see this being that close to it in value? 100-110 think I’d be all over it by now but 130k my gut just says to much and still have to say it’s a replica even tho it’s as good as the factory ones anyway but nevertheless it’s been made post factory. at 130k you'd have to reaaaally want it..
Are the 968's that much of a better car to a later 944 to command such premium prices? A 88 and on 944 turbo will probably make a 968 CS look a bit sluggish. Depends on what floats your boat. If you want outright straight line performance then a later 944 Turbo will be quicker, but the CS definitely feels lighter and has loads more low down torque. But if you're talking about values then the 968 CS will be more collectable because of the rarity, although you could argue a 944 Turbo S Silver Rose would be up there. 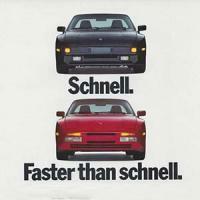 Or if you want to go all out you can pay a *lot* more for a 968 Turbo or Turbo RS, 944 Turbo Cup, 924 Carrera GT or GTS. In terms of looks I find myself always admiring the front of the 924 Carrera GT and the rear of the 968's. The 944 Turbo.... not so much. Hi guys , that is the only owner since Rob sold the car , it's a great car to drive as I shared the drive to Rennsport 2013 & back to Melbourne with Rob ! maybe self interest as own the #1 Falken Fitzy car & also the last #5 Red car that Fitzy built 18 months ago ! And you could not build one for the asking price !! As I mentioned above I saw the red car being built by Peter. Any idea what the conversion cost was. Peter told me "a lot". I assume $50k or more? My cosmetic stuff , wheels , livery & interior trim another $10k approx. Fitzgerald #4 and #5 968 Turbo RS's together this morning. All 5 cars are now in Melbourne so we'll have to try and organise a gathering. Geez you Melbournites need to stop hogging all the RS Turbos. Share them around with your fellow states. @Ossie - Have Fitzgerald produced five replicas in total now?